Not sure where you recognise Angelo Tsarouchas from? It could be anywhere – a prolific Hollywood actor, Angelo’s distinctive features have been glimpsed on dozens of blockbusters – including Al Pacino vehicle The Recruit, Cinderella Man starring Russell Crowe, and cult comedy Harold & Kumar Go to White Castle – as well as bunch of top-notch TV shows, including Mad Men, Sullivan and Son and Blue Mountain State. 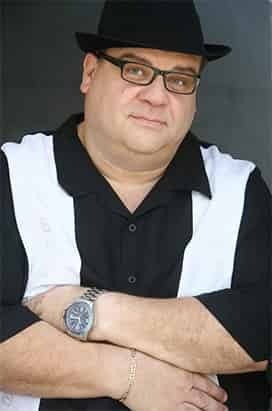 Taking the spotlight as Vinnie in the award-winning indie romp Fred and Vinnie – playing “the world’s fattest acrophobic vegetarian” – earned Angelo a Best Actor award at the London Greek Film Festival in 2012. But if LA-raised Angelo lacks the look of a Hollywood leading man, his robust figure has proved a perfect foil for his true calling – onstage as a stand-up comic. His Showtime TV comedy special Bigger is Better received more than 14 million views. A recognised headliner in his own right, Tsarouchas’ brand of funny has seen him invited on the road as part of Russell Peters’ World Tour and Vince Vaughn’s Wild West Comedy Show. Born in Canada to Greek parents, Angelo insightfully mines the Mediterranean psyche of deep-held traditions and overbearing mothers, and is widely dubbed “The Funny Greek” – we’re not saying he’s the only one, but those two words tell you everything you need to know about this one-of-a-kind personality.